Each of my books contains a collection of eight sudoku puzzles, 1-per-page, with a page of hints and a page of answers in the back. These booklets are in PDF format and need the Adobe Acrobat Reader to view or print. You can also download all 800 of these puzzles in a 4-per-page format ( with hints and answers, with answers but no hints, or with neither hints nor answers). If you like these puzzles, check out my other puzzles too! Want to save some trees? Try my Interactive Sudoku, an online version of these puzzles that works on your browser or iPad. Krazydad Sudokus are also available in a daily puzzle (for print or online). Problems printing puzzles in Internet Explorer 9? Try these work-arounds. 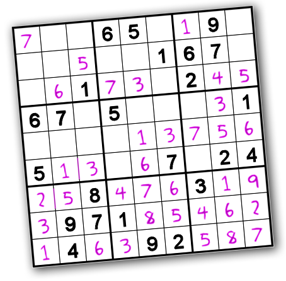 Here's a blank sudoku grid in case you need to start over. Help me pay for my cat's salsa lessons by donating with Paypal. Thank you!! Click here for the 4-per-page format.